This article is about the year 1610. 1610 (MDCX) was a common year starting on Friday of the Gregorian calendar and a common year starting on Monday of the Julian calendar, the 1610th year of the Common Era (CE) and Anno Domini (AD) designations, the 610th year of the 2nd millennium, the 10th year of the 17th century, and the 1st year of the 1610s decade. As of the start of 1610, the Gregorian calendar was 10 days ahead of the Julian calendar, which remained in localized use until 1923. Some have suggested that 1610 may mark the beginning of the Anthropocene, or the 'Age of Man', marking a fundamental change in the relationship between humans and the Earth system, but earlier starting dates (ca. 1000 C.E.) have received broader consensus, based on high resolution pollution records that show the massive impact of human activity on the atmosphere. Wikimedia Commons has media related to 1610. January 7: Galilean moons are first observed. August 2: Henry Hudson sails into Hudson Bay. January 6 – Nossa Senhora da Graça incident: A Portuguese carrack sinks near Nagasaki, after fighting Japanese samurai for four nights. 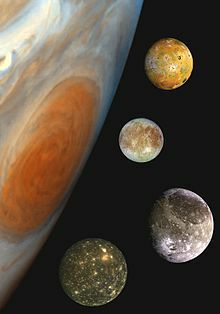 January 7 – Galileo Galilei first observes the four Galilean moons of Jupiter: Ganymede, Callisto, Europa and Io, but is unable to distinguish the latter two until the following day. May 14 – François Ravaillac assassinates Henry IV of France. May 23 – Jamestown, Virginia: Acting as temporary Governor, Thomas Gates, along with John Rolfe, Captain Ralph Hamor, Sir George Somers, and other survivors from the Sea Venture (wrecked at Bermuda) arrive at Jamestown; they find that 60 have survived the "starving time" (winter), the fort palisades and gates have been torn down, and empty houses have been used for firewood, in fear of attacks by natives outside the fort area. May 24 – Jamestown, Virginia: The temporary Governor, Thomas Gates, issues The Divine, Moral, and Martial Laws. May 27 – Regicide François Ravaillac is executed by being pulled apart by horses in the Place de Grève, Paris. June 7 – Jamestown: Temporary Governor Gates decides to abandon Jamestown. June 8 – Jamestown: Temporary Governor Gates' convoy meets the ships of Governor Thomas West, 3rd Baron De La Warr (Delaware) at Mulberry Island. June 10 – Jamestown: The convoy of temporary Governor Gates, and the ships of Governor Lord De La Warr, land at Jamestown. July – Monteverdi's Vespro della Beata Vergine (Marian Vespers) are published in Venice. July 4 – Polish–Muscovite War – Battle of Klushino: The outnumbered forces of the Polish–Lithuanian Commonwealth defeat the combined Russian and Swedish armies; Polish troops go on to occupy Moscow. July 5 – John Guy sets sail from Bristol, with 39 other colonists, for Newfoundland. July 9 – Lady Arbella Stuart, a claimant to the throne of England, is imprisoned for clandestinely marrying William Seymour, 2nd Duke of Somerset, another claimant, without royal permission on June 22. August 2 – Henry Hudson sails into what is now known as Hudson Bay, thinking he has made it through the Northwest Passage and reached the Pacific Ocean. August 9 – Anglo-Powhatan Wars: The English launch a major attack on the Paspahegh village, capturing and executing the native queen and her children, burning houses and chopping down the corn fields; the subsequent use of the term "Paspahegh" in documents refers to their former territory. August 21 – The Tuscans fight the Turks. October 9 – Poland, under the command of Hetman Stanisław Żółkiewski, take control of the Kremlin during the Polish–Muscovite War. October 10 – The Tuscans fight the Turks again. October 17 – Louis XIII of France is crowned. The Manchu tribal leader Nurhaci breaks his relations with the Ming dynasty of China, at this time under the aloof and growingly negligent Wanli Emperor; Nurhaci's line later becomes the emperors of the Qing dynasty, which overthrows the short-lived Shun dynasty in 1644, and the remnants of the Ming throne in 1662. The Orion Nebula is discovered by Nicolas-Claude Fabri de Peiresc. Publication is completed of the Douay–Rheims Bible (The Holie Bible Faithfully Translated into English), a translation of the Bible from the Latin Vulgate into English made by members of the English College, Douai, in the service of the Catholic Church. Jakob Böhme experiences another inner vision, in which he believes that he further understands the unity of the cosmos, and that he has received a special vocation from God. Work starts on the Wignacourt Aqueduct, in Malta. Santa Fe, New Mexico is founded as the oldest city in the state. Approximate date – First shipments of tea to Europe, by the Dutch East India Company. Winter – Dr. Bonham's Case is decided by Edward Coke, Chief Justice of the Common Pleas of England. Coke affirms the supremacy of the common law, which limits the power of Parliament as well as the king. ^ Alexander More; et al. (May 31, 2017). "Next generation ice core technology reveals true minimum natural levels of lead (Pb) in the atmosphere: insights from the Black Death". Geohealth. 1 (4): 211–219. doi:10.1002/2017GH000064. ^ "Anthropocene: New dates proposed for the 'Age of Man'". BBC. 11 March 2015. Retrieved 12 March 2015. ^ "Defining the Anthropocene". Nature. 11 March 2015. doi:10.1038/nature14258. ^ Palmer, Alan; Veronica (1992). The Chronology of British History. London: Century Ltd. pp. 170–172. ISBN 978-0-7126-5616-0. ^ Pope, Hugh (July–October 1910). "The Origin of the Douay Bible". The Dublin Review. 147 (294–295).